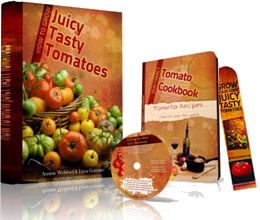 Plant tomato plants into soil beds or containers when they are 6-12in (15-30cm) tall, with well-developed, healthy rootballs. Moist (not soggy) rootballs slip out of pots more easily. When planting in outdoor beds, use an appropriate support system—try wire cages for bushes and wooden stakes for cordons. Dwarf plants don't need a support. 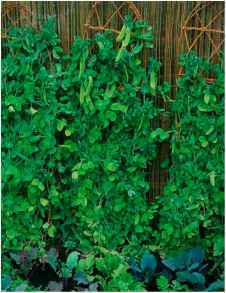 Choose an overcast, still day to reduce stress to the plant from sun and wind and plant in a sheltered spot, such as against a sunny wall or downwind of a hedge or trellis. 1 While soaking the plant pot in water or a diluted seaweed solution (for 2-3 hours), dig a planting hole, about twice the pot's depth. 2 Hammer in a sturdy stake next to the planting hole. Remove the plant from its pot and place it into the soil. 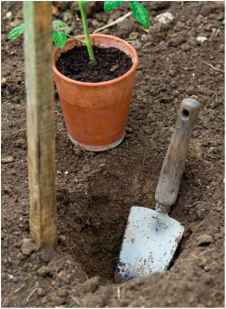 3 Backfill with soil so that the stem is covered at least up to the level of the seed leaves. This will encourage new roots to form, which stabilizes the plant and can increase yield, as there are more feeding roots. Firm. 4 Water in well and label. In areas where cutworms are a problem and may nibble the stem, make a tinfoil or cardboard collar and slip it around the base of the stem. 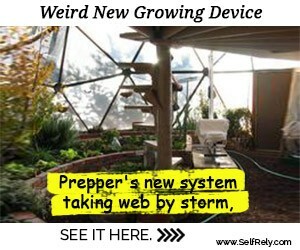 This should protect the young plant until it is robust enough to resist attack. 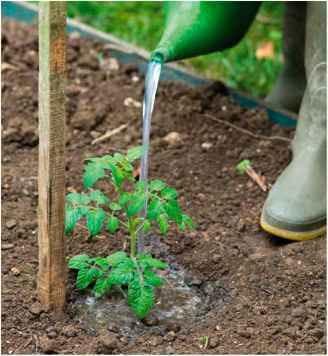 When you are transferring young tomato plants into containers such as pots, hanging baskets, or growing bags, you need to observe the same basic principles as for planting (pp98-99). One advantage of containers is that you can start the tomatoes earlier and keep the planted containers under cover until conditions are favorable outdoors, which wil give you an earlier crop. You can't do this with growing bags, however, as they are difficult to move once planted. You may wish to plant a trailing or dwarf tomato plant into a hanging basket. Keep it in a light, airy room, or in the greenhouse, at a minimum of 59°F (15°C), until all risk of frost is past. 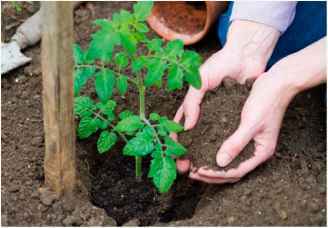 Tomato plants in pots and growing bags need a sturdy support system of canes and twine, stakes, or wires on fencing or walls. Bamboo canes are often used, but they may not be able to cope with the weight of some of the more vigorous plants. Opt for stakes in this instance. You can help to hold canes upright in growing bags by tying the top of each cane to a greenhouse strut or some other strong support outdoors such as a trellis. Cut 3 planting holes in the plastic. 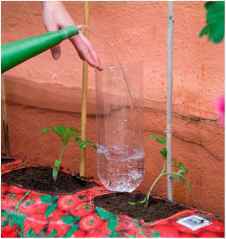 Add a watering funnel (made from a baseless plastic bottle) to avoid water run-off. 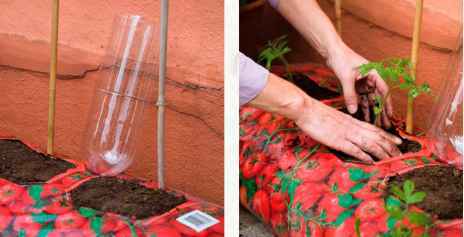 To plant the bag, water each plant well and insert it in its hole at the same depth or slightly deeper than before. Firm. When positioning containers, choose a spot that provides shelter from strong winds and excessive rain. The most effective barriers are not solid screens such as walls or fences, but those that are around 60 percent permeable, which filter the wind rather than causing damaging eddies. 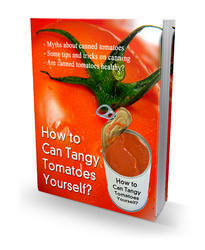 However, in cool areas, tomatoes trained against a sunny wall will benefit from reflected heat. 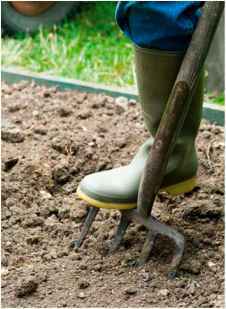 You can also improve drainage on heavy soils by building raised beds or adding plenty of organic matter to increase the moisture retention of light soils. 3 Punch some drainage holes into the base of the bag to keep the soil from becoming stagnant, then water the plants thoroughly. 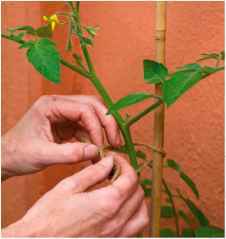 4 As the plants grow, tie the main stems to the supports, using soft twine in a figure-eight pattern—don't tie the stems too tightly.